The World Cup in Pesaro ended successfully for Akeksandra Soldatova and the whole Bulgarian Group. They won the individual and the group All-around competitions. Because of several retirements and as Rio Olympic champion Margarita Mamun hasn’t returned to competition yet, Pesaro set the stage for new stars to rise in Rhythmic Gymnastics. Mamun’s compatriots Soldatova and Dina Averina seized the opportunity, dominating the individual competition by finishing first and second in the All-around and taking the top places on the podium in all apparatus finals. Both are known to the Pesaro public, having already competed in the Adriatic Arena at the 2015 and 2016 editions, respectively. Rio finalist Katsiaryna Halkina of Belarus came third in the All-around and added silver with the Clubs and bronze with the Ball. Fellow Olympian Laura Zeng, the only U.S. gymnast ever to win Rhythmic medals in World Cup competition, took home the bronze medals for Hoop and Clubs, her third and fourth career World Cup medals. Alexandra Agiurgiuculese, the 2016 Italian junior national champion, who made her senior international debut at the 2017 Grand Prix in Moscow, won bronze for her Ribbon routine at her first World Cup competition. 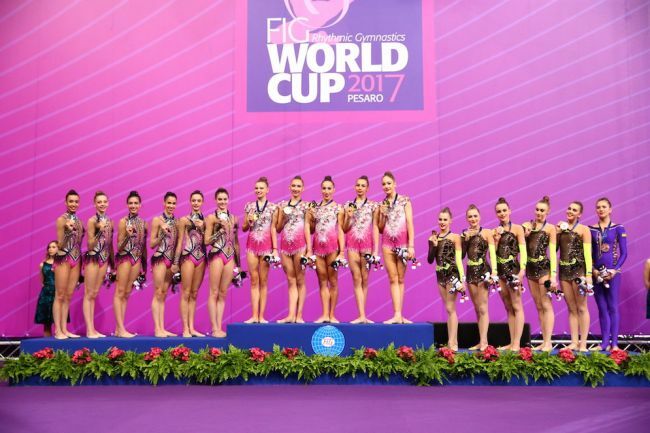 While 2016 Olympic bronze medallist Bulgaria outscored host Italy and Ukraine in the Group All-around, Italy’s ‘Farfalle’ (‘Butterflies’) rose to the occasion during apparatus finals, where they picked up both gold medals. Bulgaria and China came second and third with the 5 Hoops respectively, and Russia and Ukraine joined Italy on the podium for the 3 Balls and 2 Ropes. < Rebecca Tunney is retired!